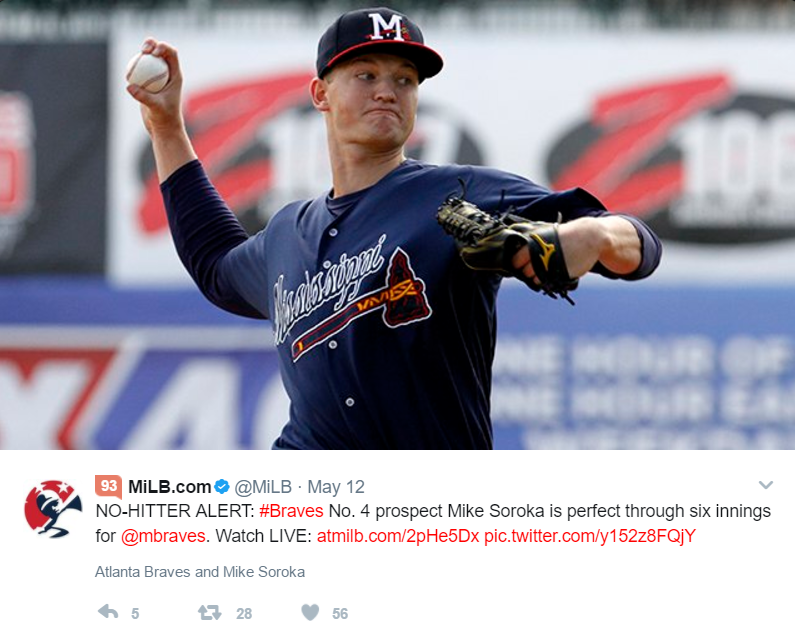 This Calgarian, who was a first round draft pick of the Atlanta Braves in 2015, got promoted to the AA Mississippi Braves and got off to a hot start. In his first three starts he posted a 1.62 ERA and struck out 18 while only walking one batter - Chris Sale like numbers! Alas, he gave up a hit in the 7th inning and was pulled. This start helped him win weekly Pitcher of the week honors. On the season he his now 3-3, 2.84 ERA and a 8.5 K:BB ratio! He is ranked #44 by Baseball America and continues to move up. He’s still only 19, but many Braves followers expect him to get called up as early as September of next year. Another Calgarian, he has been doing the bulk of the catching for the AA Portland Sea Dogs after being promoted from Salem. He started the season in grand style, hitting a grand slam in his second game at AA. This Edmonton born pitcher pitched in a handful of games for the Cubs at the end of last season,. He started this year in AAA Iowa, but just got recently called up and made his season debut on a Saturday afternoon game against the Yankees. He came into the game in the 4th inning after the Yankees had already put up 8 runs, and shut them down for 3 strong innings. Unfortunately in his 4th inning of work, he gave up a 3 run home run to Aaron Hicks. He is now back in Iowa, awaiting the next call up, but so far is the only Albertan to appear in an MLB game this season. This Drayton Valley pitcher has been pitching for the AA Blue Jays affiliate, the New Hamphsire Fisher Cats. He's had a rough start, currently at 1-5 with an ERA north of 5. This Lethbridge native, 2B/3B/OF in the Giants organization, started the season with the Richmond Flying Squirrels, and is now playing for the San Jose Giants. He has been struggling with the bat, as he was only hitting .159 when he was demoted from AA and is not 1 for 17 in A+ ball. Injuries were the main contributor that caused the Mets to not put this Calgarian on their roster after spring training. But he is still involved in baseball, being a coach with the local Okotoks Dawgs of the WMBL. To keep track of these players, make sure to follow me on twitter @baseballruben. Where is the home field advantage in baseball?